Within her art practice, Omo Okolo celebrates spontaneity. This theme runs through her handmade books, paintings and sculpture. She is a very experimental mixed media artist. Brimming over with ideas, she lets her art speak. 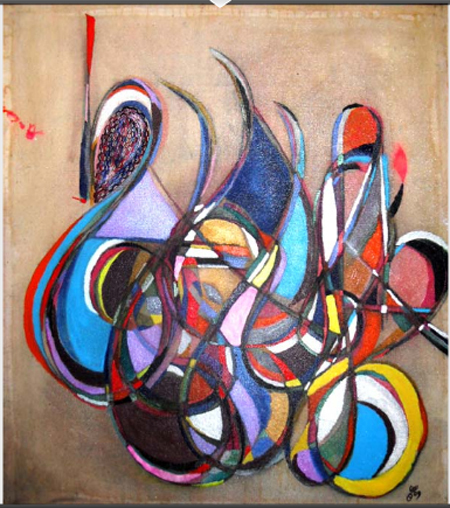 Her paintings are inspired by the harmony of calligraphy and the energy of abstract expressionism. She works in oils, acrylics and inks. Her handmade books celebrate the spontaneity of scribble. As a student artist, she wrote and sketched randomly in her notebooks, and this has informed her book art practice. Her eco-friendly sculptures are a testament to continuity. Her sculptures are formed from found objects. Rebirth and a new way of seeing underlines her 3D art practice. She is a Book Art graduate from the University of the Arts London.